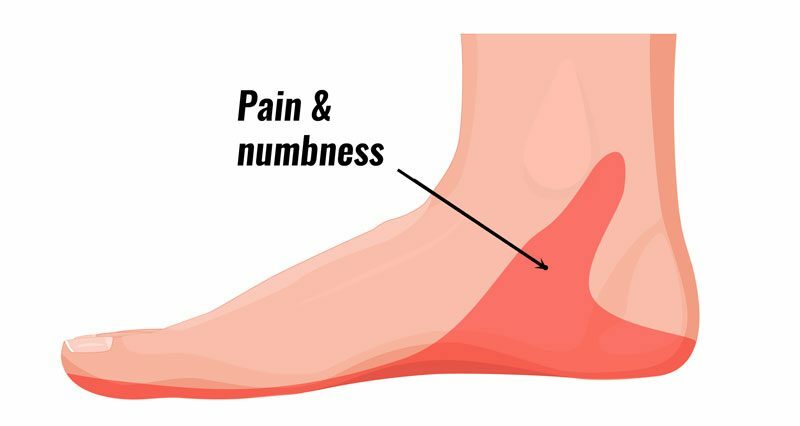 Tarsal tunnel syndrome causes burning pain in the foot, sometimes with pins and needles or numbness, which may radiate into the heel and arch of the foot. 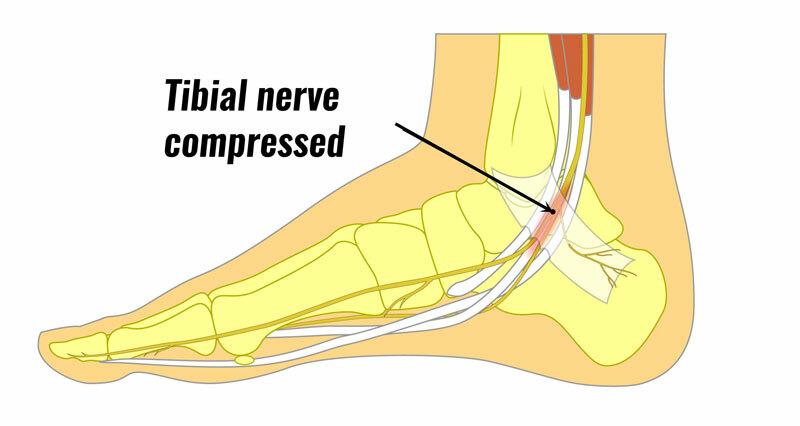 It is caused by pressure on a nerve which passes along the inside of the ankle. Symptoms include pain, which is often described as burning pain, that radiates into the arch of the foot, heel and sometimes the toes. Pins and needles or numbness may be felt in the sole of the foot. Pain may be worse when running or standing for long periods of time and will often be worse at night. The area under the medial malleolus on the inside of the ankle may be tender to touch. A professional therapist may use tinels test to diagnose tarsal tunnel syndrome. This involves tapping the nerve just behind the medial malleolus (the bony bit on the inside of the ankle) with a rubber hammer. Pain indicates a positive test. Sometimes it is initially mistaken for plantar fasciitis which also causes pain from the inside heel and throughout the arch of the foot. Neural symptoms (such as tingling or numbness), as well as the location of tenderness when touching the area, should help to easily distinguish between the conditions. Tarsal tunnel syndrome occurs when the posterior tibial nerve which passes down the inside of the ankle becomes compressed or trapped. The nerve passes along a passage called the tarsal tunnel, just below the medial malleolus. If you overpronate (where your foot rolls or flattens) when you walk or run then this can contribute to the compression of the nerve. Because overpronation is a key factor, it is common for the problem to occur in both feet at the same time. Where the condition occurs spontaneously in people involved in running or running based sports, then overpronation is the most frequent cause. The term anterior tarsal tunnel syndrome is sometimes applied to a rare entrapment of the deep peroneal nerve at the front of the ankle. However, this is not strictly the same as symptoms appear on the top of the foot and radiate towards the 1st and 2nd toes. Tarsal tunnel syndrome can be both idiopathic, meaning it occurs spontaneously for apparently no reason, or it can be associated with a traumatic injury. Talonavicular coalition – fusing of two of the tarsal bones. A cyst or ganglion in the tarsal tunnel. Correct any biomechanical dysfunction such as overpronation. A gradual return to full fitness. Rest from any aggravating activities and apply the PRICE principles of protection, rest, ice, compression, and elevation. 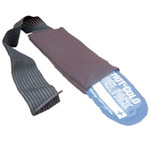 Apply cold therapy in the acute phase when the foot or ankle is painful and inflamed. Your Doctor may prescribe anti-inflammatory medication to help reduce pain and inflammation. Once the initial pain and inflammation have gone then a full rehabilitation program which includes stretching exercises and strengthening exercises for the foot can begin. Stretching exercises may include stretching for the calf muscles (gastrocnemius and soleus) as well as the plantar fascia under the foot. Strengthening exercises are similar to that of an ankle sprain but may focus more on inversion strengthening or strengthening as the foot turns inwards. Consult a foot specialist, podiatrist or physiotherapist who can assess this and biomechanical problems of the foot. A professional therapist or doctor can accurately diagnose the injury and establish any possible causes. Nerve conduction studies may be done to confirm the diagnosis and indicate the location of the entrapment. An X-ray or MRI may also be useful to determine the presence of any other structures such as cysts, arthritis or a tarsal coalition. If conservative treatment fails then a corticosteroid injection may be administered. For stubborn and persistent cases, surgery may be required to decompress the nerve. The operation aims to decompress the nerve by freeing the soft tissue structures in the area, creating more space for the nerve. Surgery may be indicated when the diagnosis is definite and if the athlete has endured several months of problems without a response to the conservative treatment above. The success rate from surgery is mixed, with a high risk of complications. The procedure itself is very fast, although a complete recovery can take anywhere from a couple of weeks to a few months. Both stretching and strengthening exercises are important for rehabilitation and preventing of Tarsal Tunnel syndrome. Stretching the calf muscles is particularly important as tight gastrocnemius and soleus muscles (which make up the calf muscle group) can increase overpronation. A good starting point is to assess the flexibility of the calf muscles. Exercises should always be done pain-free. To assess gastrocnemius muscle flexibility, the athlete sits on the couch with the legs out straight in front. The feet should be hanging just over the edge of the couch. If gentle pressure is applied to the foot, an angle of 90 degrees should be possible without needing to force it. The therapist should feel a natural resistance even before the athlete feels a stretch. The Soleus muscle is tested in the same way but with the knee bent. This relaxes the large gastrocnemius calf muscle leaving the soleus still stretched. It is rare that the soleus muscle will be tight as tight gastrocnemius muscles are more common, and can contribute to developing tarsal tunnel syndrome. Stretching the gastrocnemius muscle must be done with the leg kept straight when being stretched. One method is to place the heel of the back leg on the floor leaning against a wall. If you cannot feel a stretch move the back leg further back. Hold for ten seconds, repeat three to five times and repeat the set three times a day. Gradually hold the stretch for longer, up to 45 seconds. Another way to stretch the gastrocnemius muscle is by dropping down off a step. This is more suitable for athletes with very flexible calf muscles. Stretching the soleus muscle, which is lower down at the back of the leg, must be done with the leg bent at the knee. Lean forwards pressing the back heel into the ground until a stretch is felt. If it is not possible to feel a stretch, then place something underneath the toes to raise the front of the foot, or put the ball of the foot up against the wall and push the knee forwards. Bending the knee takes the Gastrocnemius muscle, which attaches above the knee, out of the stretch. The plantar fascia is a band of tissue under the sole of the foot which runs from the heel to the forefoot. Stretching the plantar fascia can be done by pulling the great toe and forefoot upwards. It should be possible to see and feel the plantar fascia being stretched under the foot. Hold the stretch for about 30 seconds. Repeat five times and aim to stretch 3 times a day. Remember stretching is a long-term process. It will need to be maintained long after you feel the injury has healed. Another way of stretching the plantar fascia is by rolling it over a round or cylindrical shaped object such as a ball, rolling pin or can of soup. The can of soup can be placed in the freezer to include a cold therapy effect as well. Roll the foot repeatedly over the ball applying downwards pressure onto the plantar fascia. It acts like a deep tissue massage to help stretch the fascia. Tarsal tunnel syndrome exercises should include strengthening the muscles responsible for supination to help avoid pronation. In particular, strengthening the tibialis posterior and eccentric strengthening of the peroneal muscles should help to slow the movement of pronation. To begin strengthening the tibialis posterior, the muscle can be contracted without movement of the ankle/foot. The patient sits on the floor with their ankle just to the outside of a chair or table leg. Alternatively, a partner or friend can apply resistance with their hand. The patient then attempts to move the foot inwards against the resistance. This contraction can be held for 5-10 seconds, before resting and repeating 5-10 times. Start at the bottom of this range and gradually increase time and reps.
A resistance band is tied around the foot with the other end attached to a fixed point. The foot is turned inwards against the resistance of the band. Slowly return to the start position, rest and repeat 10-20 times. Begin with only 10 reps and gradually increase. This can be performed every day provided it is pain-free. To make it harder, start with the band under increased tension by shortening the section being used. To work the peroneal muscles that help control pronation or eversion of the foot, a partner is needed. The partner tries to push the foot into pronation and the patient resists this movement, slowing and controlling it. The force and speed the pronation (eversion) force is applied with can be slowly increased as strength improves. Heel-toe walking is a functional exercise more closely related to normal everyday movements. Walk slowly across the floor from the heel with the toes pointing up. Then, as the foot rolls forward, push up onto the toes. Continue walking with a heel-toe action until you feel the muscles working. Variations on this exercise include walking only on the heel or walking only on the toes. Exercises can be done twice a day and progressed by increasing the duration of the walks.